My interest in composite material research began my junior and senior years at Cal Poly in Aeronautical Engineering. Actually I had three senior years because I was accepted in the co-op program and worked at North American Aviation in the Composite Structures Group for one year prior to returning to Cal Poly. This also coincided with the Vietnam draft where I was served a draft notice my junior year and choose to enter the Naval Aviation Program at Alameda Island where my parents lived. After passing everything accept the eye exam for Naval Flight Officer (NFO), I had a choice to either become a NFO in air intelligence (nonflight status) and serve for three years active duty or enlist in the Naval Air Reserves as a aviation technician for 8 months active duty and return to my Co-op job at North American Aviation. I enlisted and pursued my civilian career at North American Aviation in the Composite Structures Group instead of becoming a non-flight status air intelligence NFO. My interest in composite materials was mostly motivated because of my interest in soaring both as a pilot and as a design engineer. Since most high performance sailplanes are constructed of fiber-reinforced laminated composites, I chose this topic for my senior project. More specifically I was interested in predicting the shear center for a single celled fiber-reinforced composite sailplane wing constructed with a foam core (Aero 461/462). 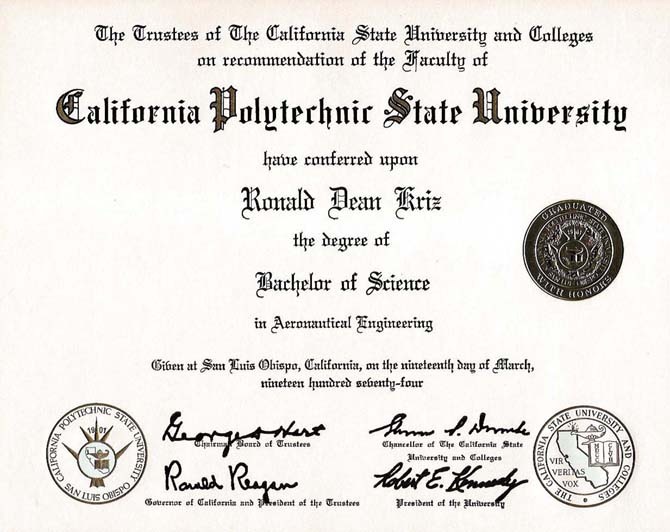 This type of construction was used by R. Knight for his senior project (1971) at Cal Poly Pomona which was also being used by Burt Rutan at Scaled Composites, who was also a Cal Poly Alumnus (1965). The objective of my senior project was to predict shear flow and hence shear center location. With the shear center location it is possible to decouple the torsion from bending. Predicting shear flow required that I learn more about the mechanical behavior of these highly anisotropic fiber-reinforced materials. After completion of my senior project I was conviced that I needed to learn more about designing structures using composite materials. I had an opportunity to acquire a damaged Libelle sailplane wing that was sheared off near the fuselage from a ground loop accident. I cut away the damaged section and reinforced the wing near the root, which was supported as a cantilever beam. The undamaged portion of the wing was instrumented and tested for shear flow distributions and compared with an analytic model for predicting shear flow in multiple cells: "Static Stress Analysis of a Sailplane Wing Constructed of Composite Materials" (Aero 408 Lab). This work coincided with my co-op job at North American Aviation / Composite Structures Group where I worked on the team that designed and built the B-1 bomber laminated graphite- epoxy vertical stablizer. During my co-op with North American Aviation, I soloed in a Schweitzer 2-33 sailplane(glider) at Pearblossom in the Mojave high dessert south east of Palmdale. Because of my interest in soaring my senior design class (Aero 444) project was a parametric design of high-performance sailplane that focused on thermal powered flight. When I returned to Cal Poly my final senior year I had an opportunity to buy and finish construction of a homebuilt sailplane called the Cherokee-II (N3773G), which was constructed with spruce wood. To share expenses Mr. William (Todd) Hodges, Mr. Richard Hannah, and I became partners. For financial reasons Todd left the partnership, but Rick and I finished the construction, flight certification, built an enclosed trailer and flighted tested N3773G at El Mirage (Aero 400 Lab). For the next two summers Rich and I flew N3773G at El Mirage. Although I was proud of owning and flying a sailplane, I always wanted to fly a sailplane constructed with fiber-reinforced composite materials. Much later I learned that fibers in spruce wood have higher strength and stiffness properties than man-made carbon fibers. The reader might recall the Spruce Goose. Interesting -- mother nature does it better. 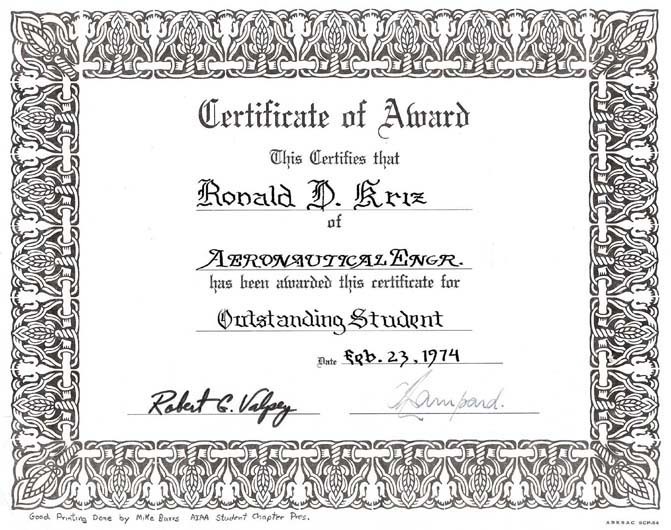 Together these four projects were recognized by the faculty and I was awarded the Outstanding Graduating Senior Award 1974, which was appreciated but could not compare with the joy of flying a sailplaneplane that I helped build and flight certify. After graduation I worked for one year in the Composites Structures Group, where North American Aviation was renamed Rockwell International, and the company sent me off to Virginia Tech to pursue a masters degree and learn more about composite materials. After my M.S. degree I did not return to Rockwell but entered the NASA Langley / Virginia Tech Composite Materials Program and finished my Ph.D. under the direction of Drs. Wayne Stinchcomb and Darrell Tenny in 1979.